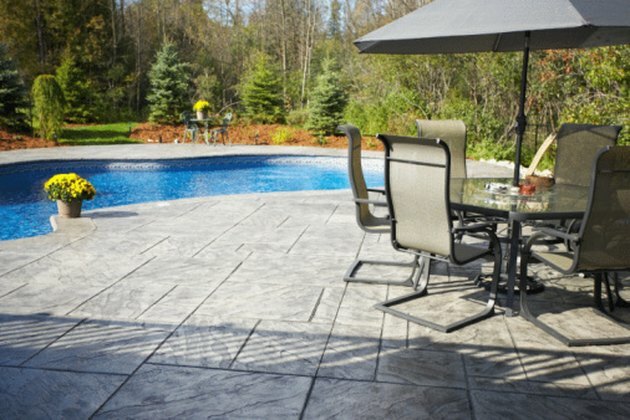 Known for their strength, weather resistance and decorative appearance, concrete patios connect home interiors with exterior living spaces to provide room for relaxing, cooking and entertaining. Because of their versatility, concrete patios can acquire oil stains from foods, leaking containers and various sources. Concrete is naturally porous and, unless sealed, easily permeated by oil. The quicker oil stains are addressed, the less likely the concrete will become permanently blemished. Oil can be removed from a concrete patio using basic techniques. Concrete patios complement backyard landscapes. 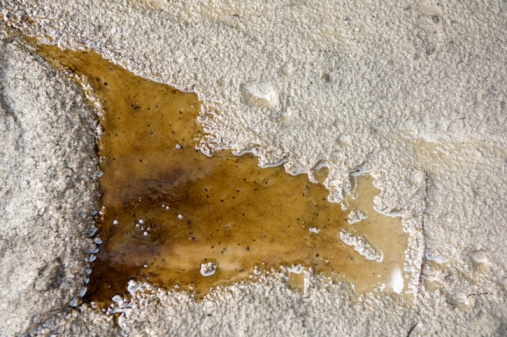 Blot up any fresh oil from the concrete using paper towels. Put on plastic safety glasses and heavy-duty rubber gloves. In a container, combine 1 oz. of trisodium phosphate and 1 cup of warm water. Mix in 1 cup of powdered talc to create a smooth paste. Spread the creamy paste over the oil stain using a trowel. Cover the paste with plastic sheeting and place bricks around the edges of the plastic to seal out air. Wait a day for the paste to dry completely. As the paste dries, it lifts the oil from the patio. Remove the plastic sheeting. Scrape the dried paste off the patio using the trowel. Sweep away the excess residue with a broom. Examine the patio for remaining oil. If some oil lingers, repeat the entire treatment. Pour kitty litter on the patio, completely covering any fresh oil. Let the kitty litter soak up the oil for two days. Sweep the oily litter particles off the patio. Examine the patio for remaining oil. If some oil lingers, cover it with liquid dishwashing detergent. Fill a pail with hot water. Use a nylon brush to scrub the hot water onto the stain and emulsify the lingering oil. Blot up the excess soapy, oily residue from the concrete using paper towels. Rinse away any remaining residue with clean water.